History: 50 year old male with uncontrolled diabetes. Diabetic Foot – this patient is status post transmetatarsal amputation, presumably for osteomyelitis given the remaining soft tissue ulceration on the lateral aspect at the base of the fifth metatarsal (yellow arrow). This is a common appearance in patients with uncontrolled diabetes and osteomyelitis of the foot. There are many muskuloskeletal complications of diabetes, most of which predominantly affect the feet. Most commonly is ulceration, cellulitis or abscess formation. Diabetic patient’s frequently develop peripheral neuropathy and therefore have difficulty detecting wounds and injuries when they first occur in their feet. Over time these wounds become infected. Radiographically they appear as seen in the image above at the yellow arrow. If left untreated, these soft tissue ulcers can lead to deeper infections that end up involving the underlying bone, eventually leading to osteomyelitis, or infection of the bone and bone marrow. Typically the patient is pain free due to their peripheral neuropathy. 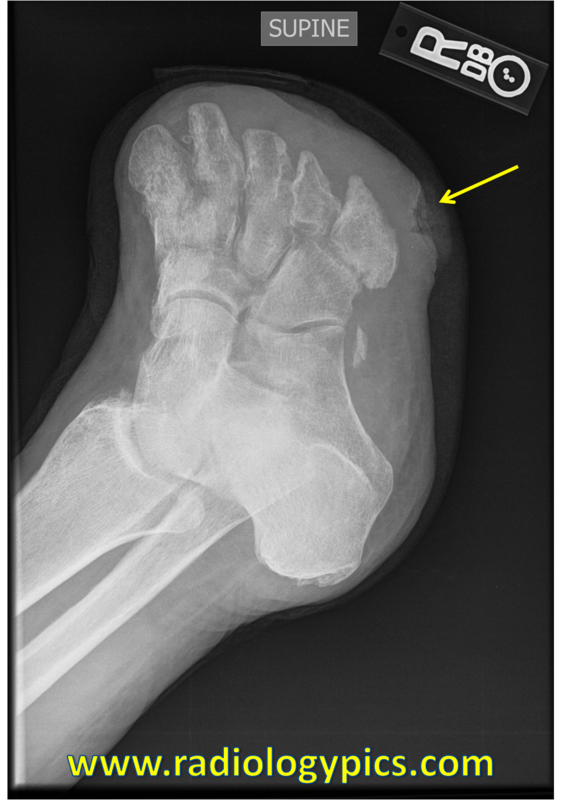 Another complication of diabetes in the foot is development of a Charcot joint, or neuropathic joint. The pathophysiology of Charcot joint is not completely understood, however, it is likely due to abnormal mechanics over time leading to the 6 Ds of neuropathic joints, which you can read about here.